When I met my boyfriend I thought I had met the love of my life and that we would stay together for the rest of our lives. I got pregnant and I now have a two year old son. Now we will most likely take different paths and I find myself looking for a place to live close to my son’s grandparents. A place I don’t really want to live, but seems like the best (and only) option right now. At first I asked myself “how could I be so wrong?”, but now I see it differently. 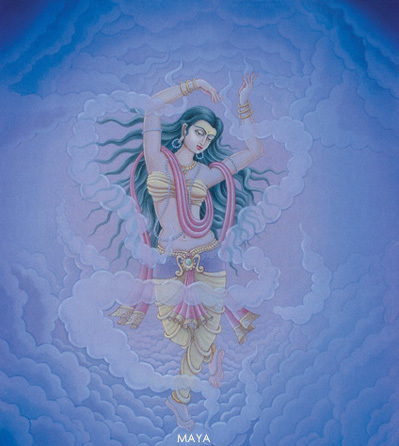 I have just been dancing to the will of Maya. Usually when there have been changes in my life I have thought that it will make things better, it would improve my life one way or another. The changes that are coming for me now, I don’t think will be “for the better”. I think they are just another change, my karma will dictate whether it will be better or not. My life is not my own anymore. Any decisions I make is strongly affected by what’s best for my son and I’m not so sure that it’s even decisions for me to make. Maya just carves the path, and I follow. Forget about free will, I have none. The only free will I have is whether I want to chant and try to have a semblance of spiritual life. Here I was thinking about how temporary life is, when my life is only a celebration of the temporary. I’m so stupid. Regarding the previous post and the benefit of being born in India, it is true that India has a favorable environment in general towards bhakti.